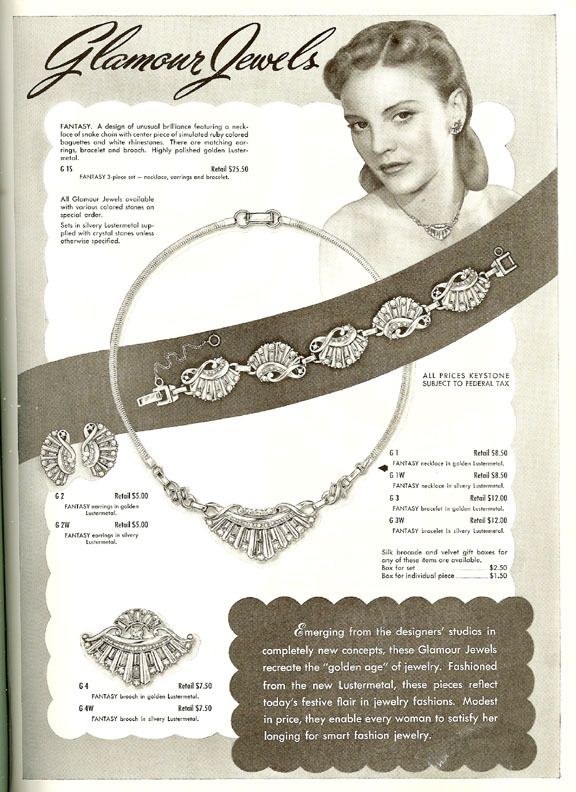 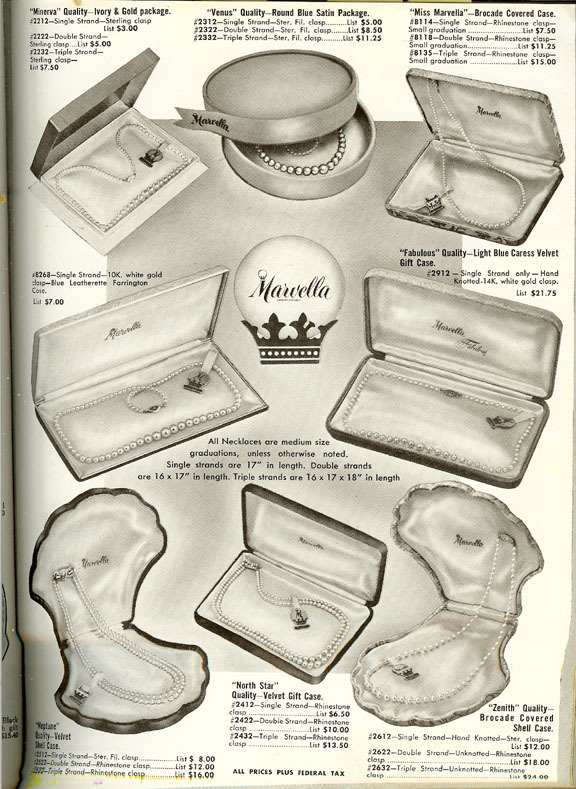 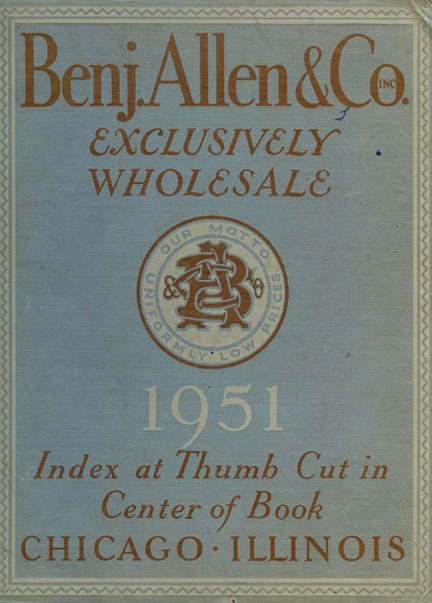 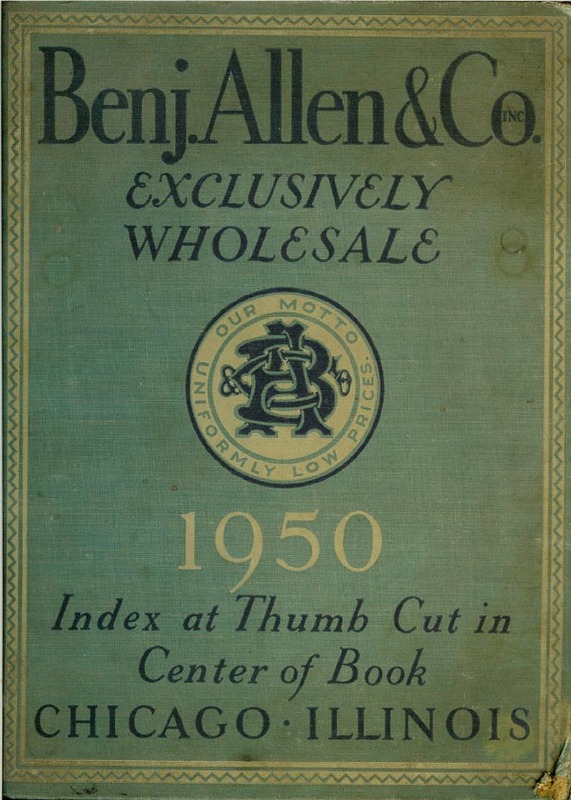 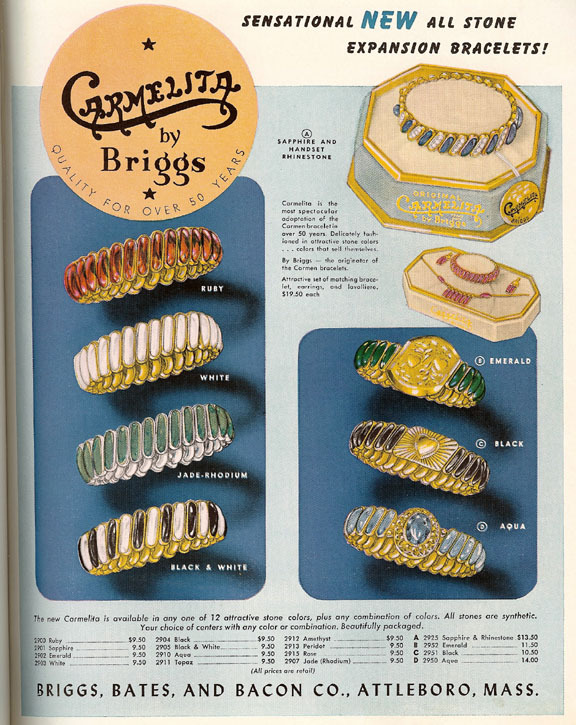 This original Benjamin Allen & Co. catalogue from 1951 includes in it's over 350 pages everything from diamonds, watches, costume jewelry, clocks, sterling silver, silver plated ware and optical goods, as well as equipment for jewelry stores and watch makers. 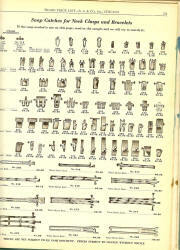 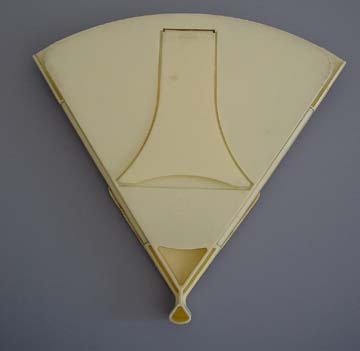 Real pieces shown as examples for reference are close proximities to the items shown in the catalogue. 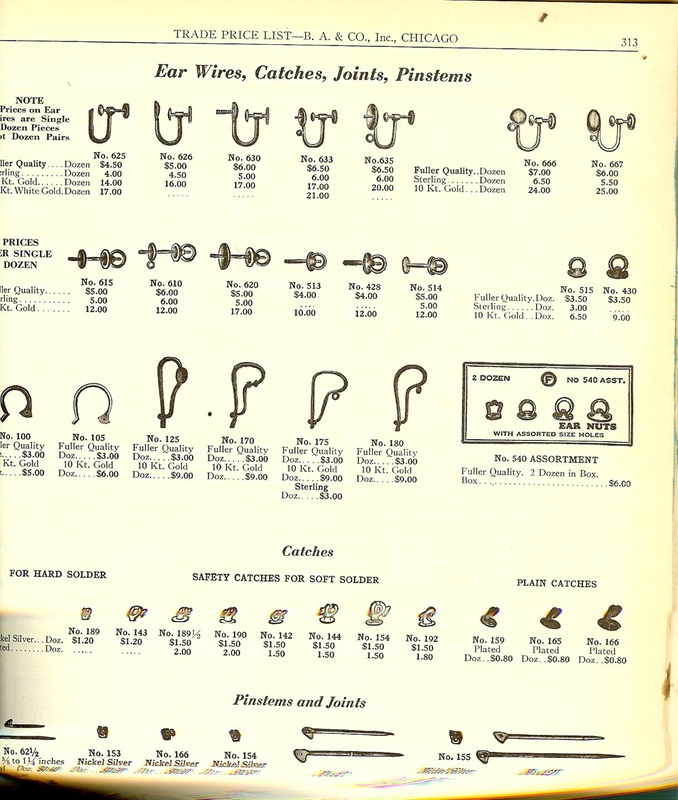 1950 Edition Vintage jewelry findings of the 50s, including safety catches, pin stems and joints, ear wires, earrings findings and nuts. 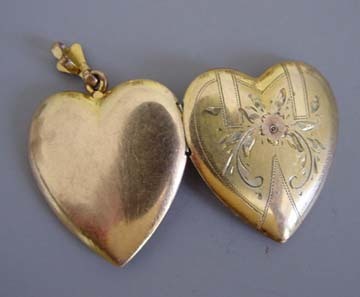 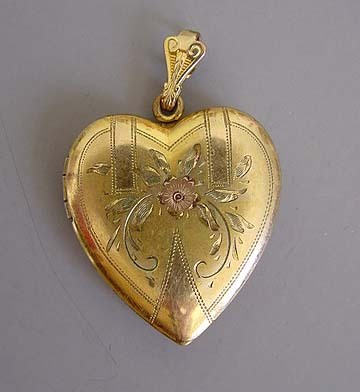 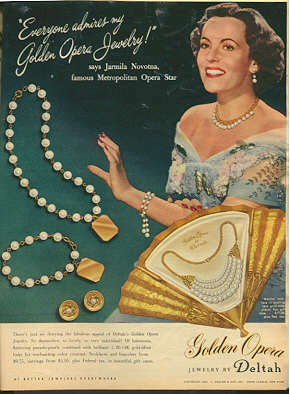 Vintage jewelry findings including keyless padlocks, sister hooks, clutches and necklace clasps. 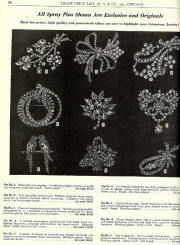 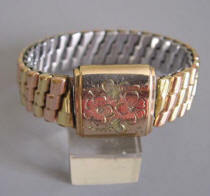 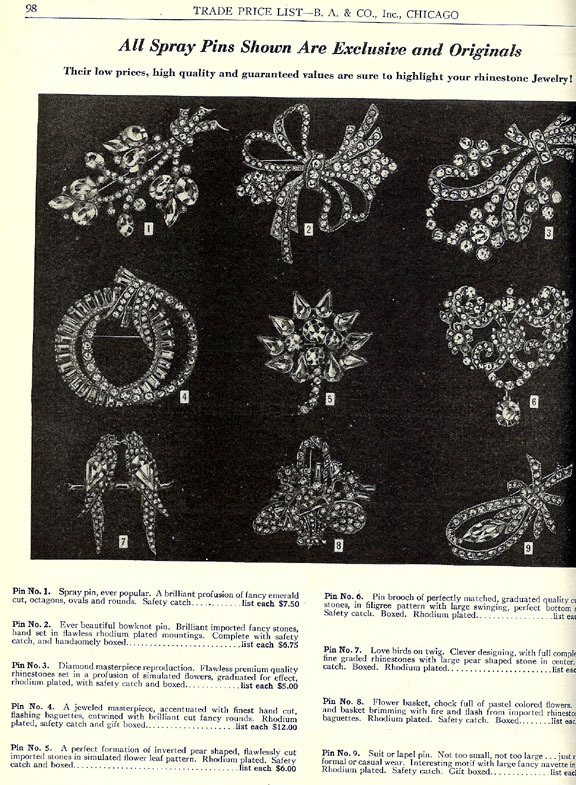 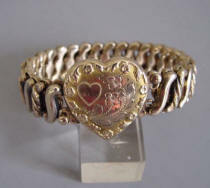 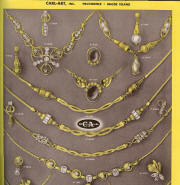 Vintage jewelry findings including snap catches for neck clasps and bracelets. 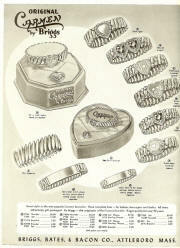 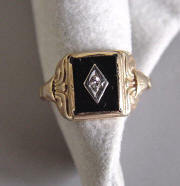 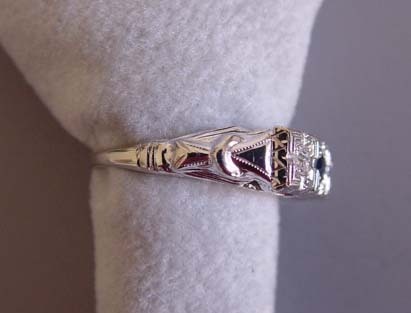 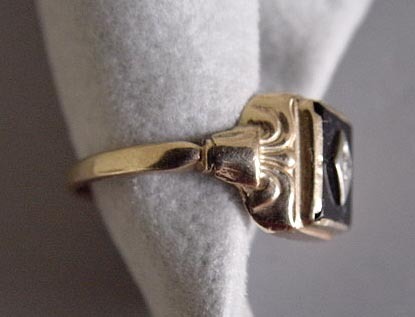 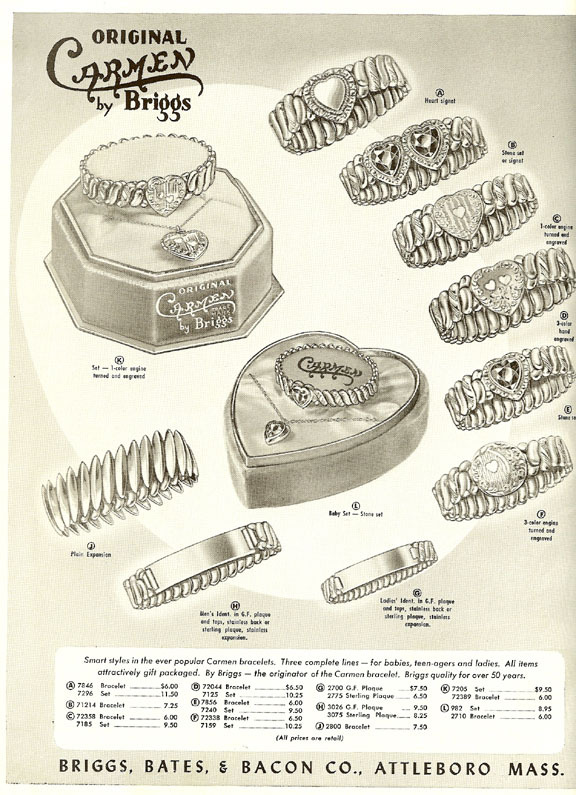 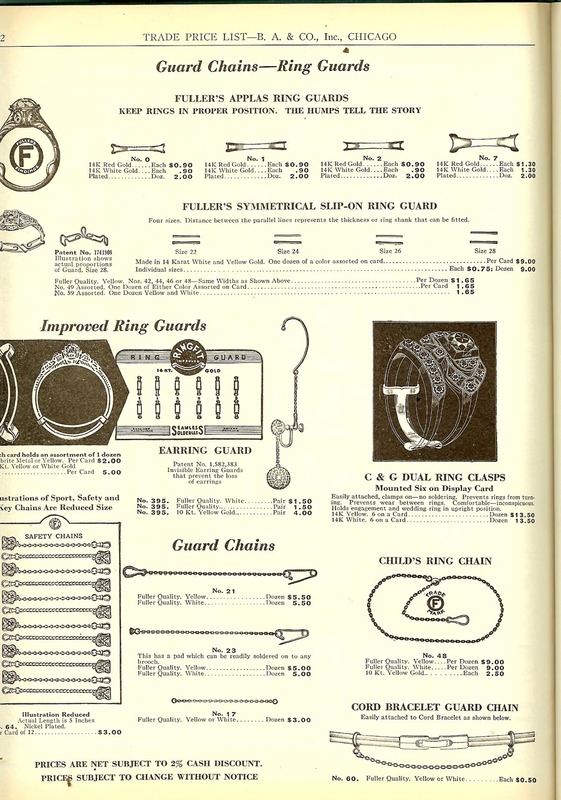 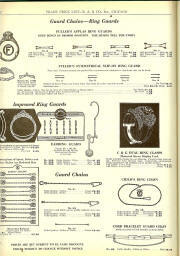 Vintage jewelry findings including guard chains and ring guards. MARVELLA "Neptune Quality simulated pearls". 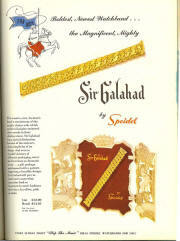 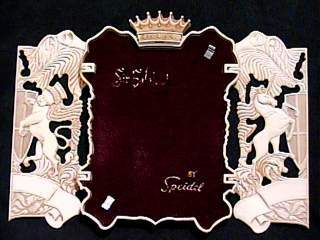 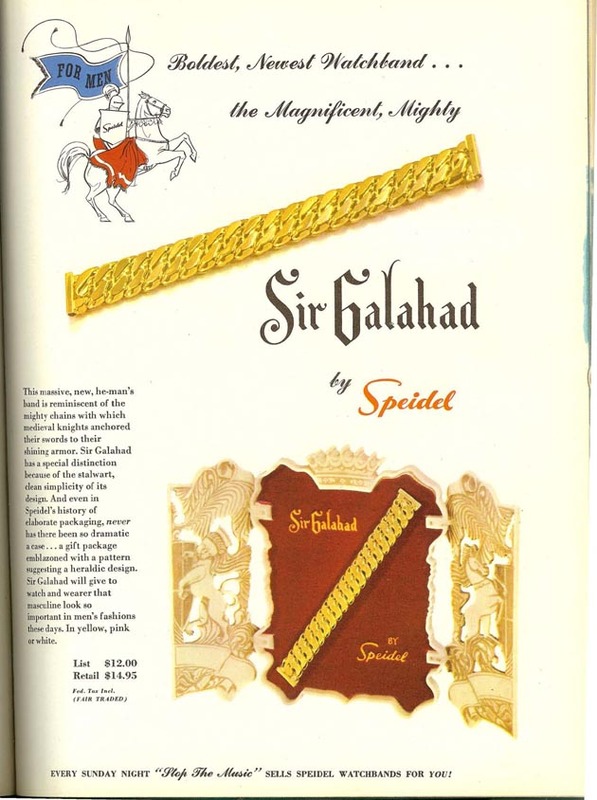 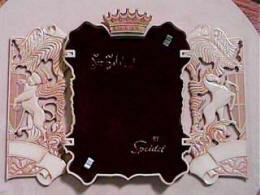 SPEIDEL "Sir Galahad" watch band. 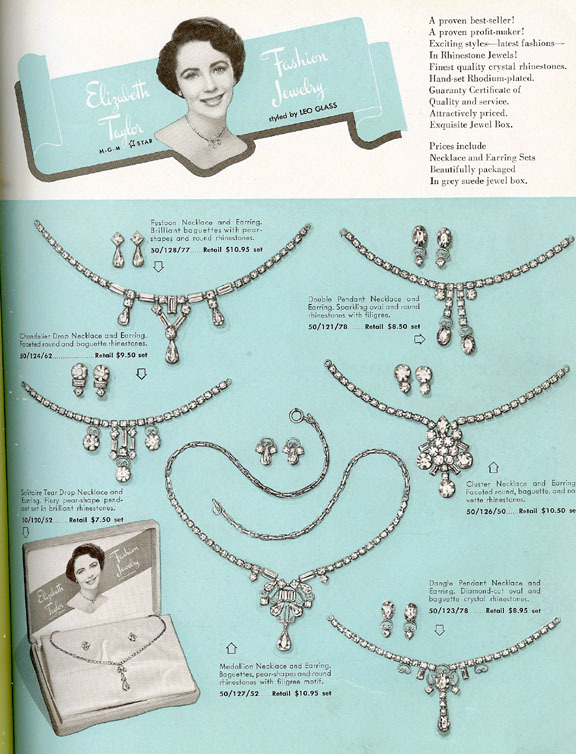 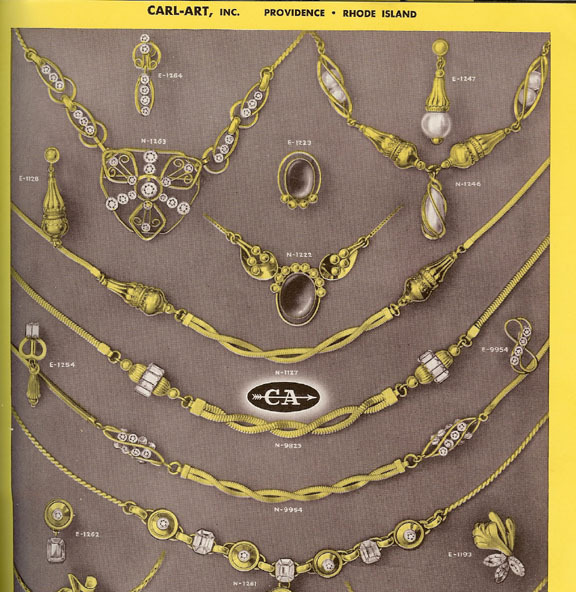 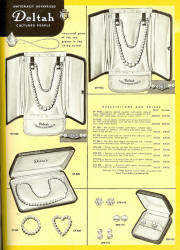 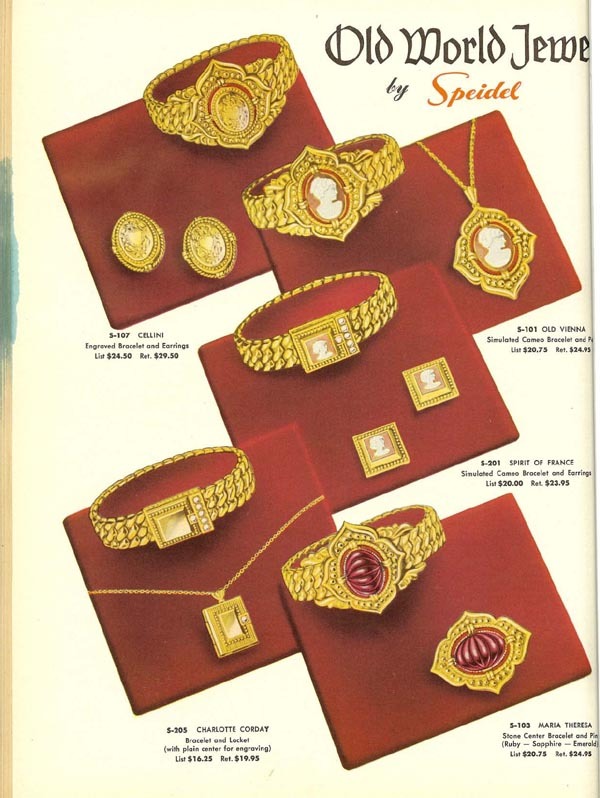 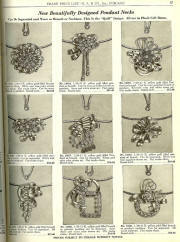 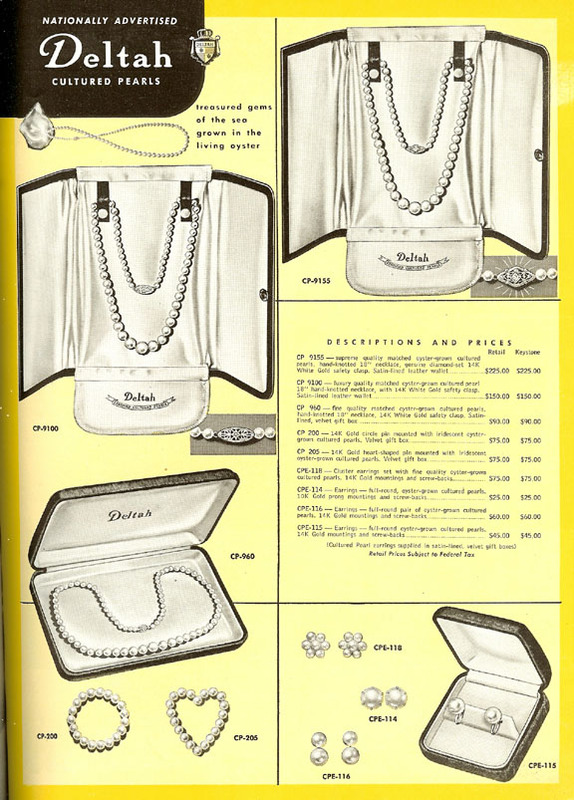 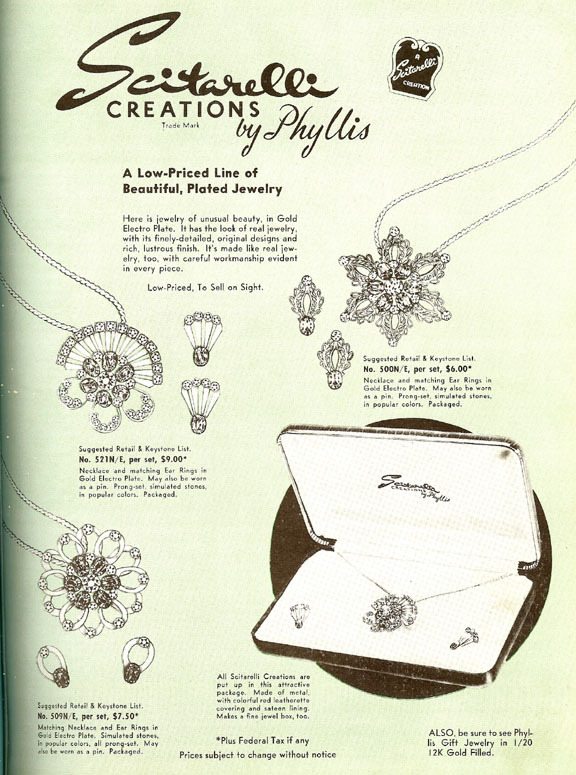 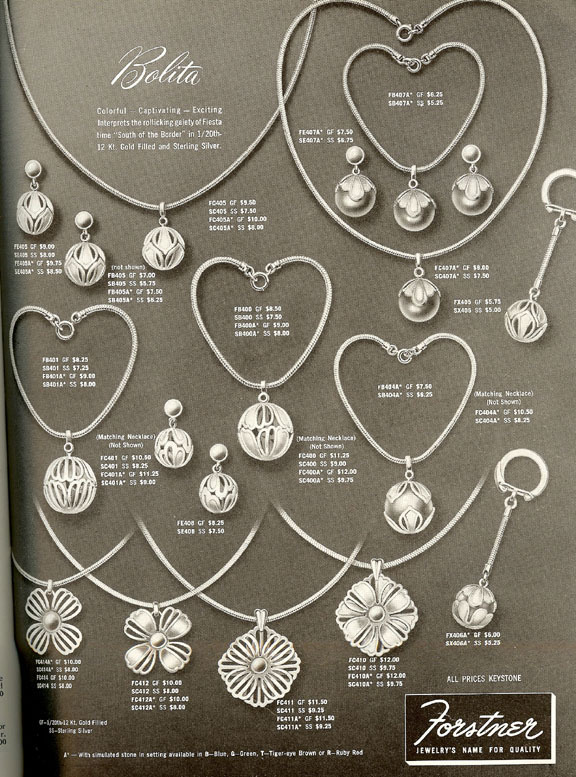 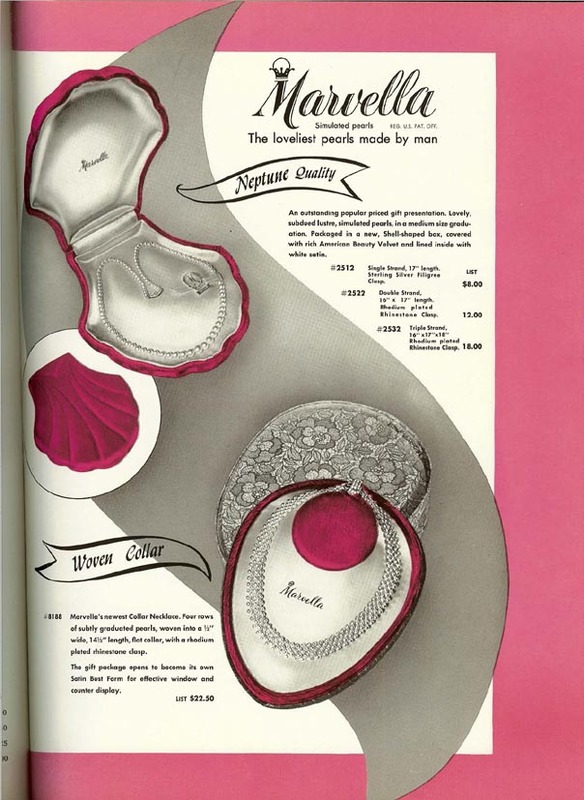 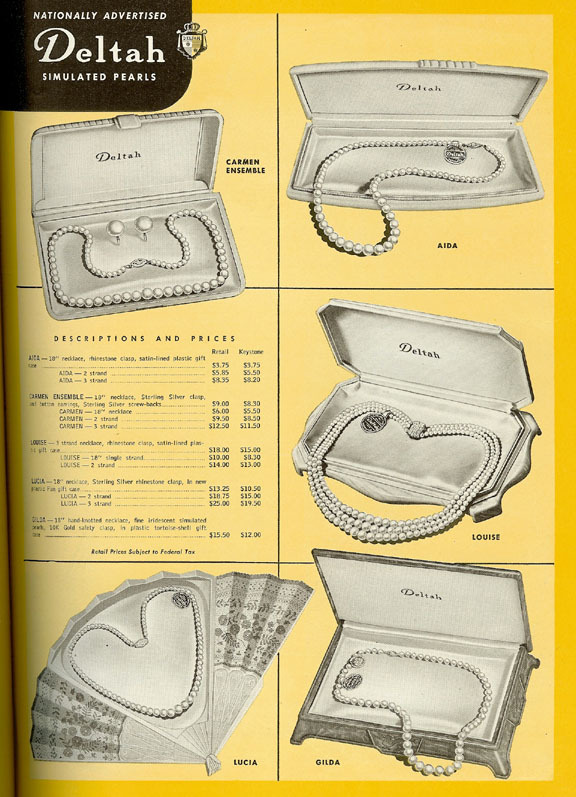 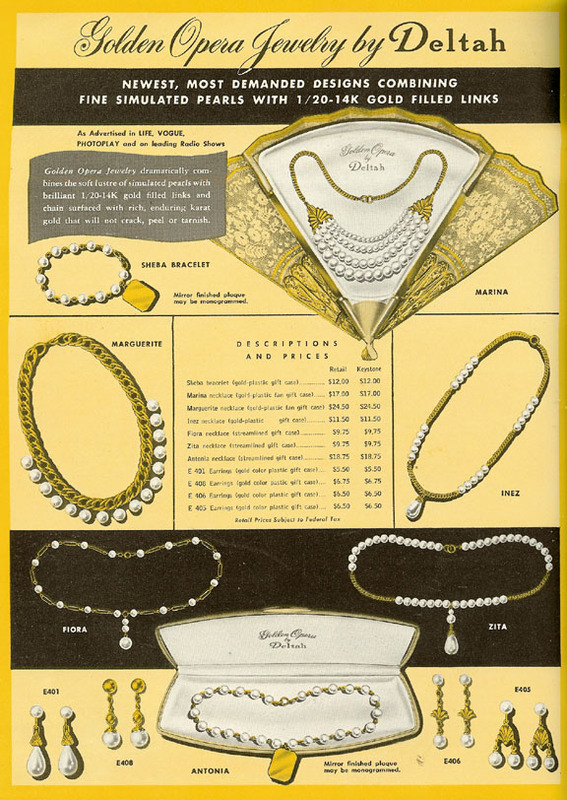 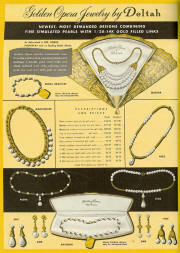 1951 Edition "14KT Yellow and White Gold Dinner Ring Mountings"
The "add-a-pearl" necklaces of the 1980s were proceeded by these dainty "Anniversary Necklaces" of the 1950s. 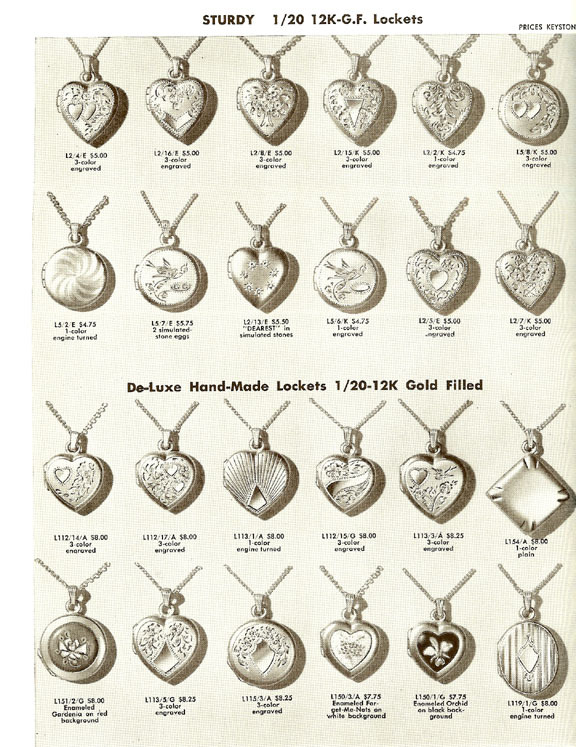 Strung in 14k gold chains, they were meant to be treasured for a lifetime. 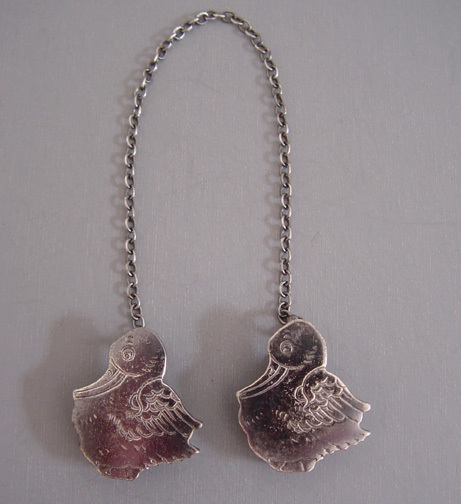 STERLING Webster sterling ducks baby bib clips, 7" total length and each clip is 1". 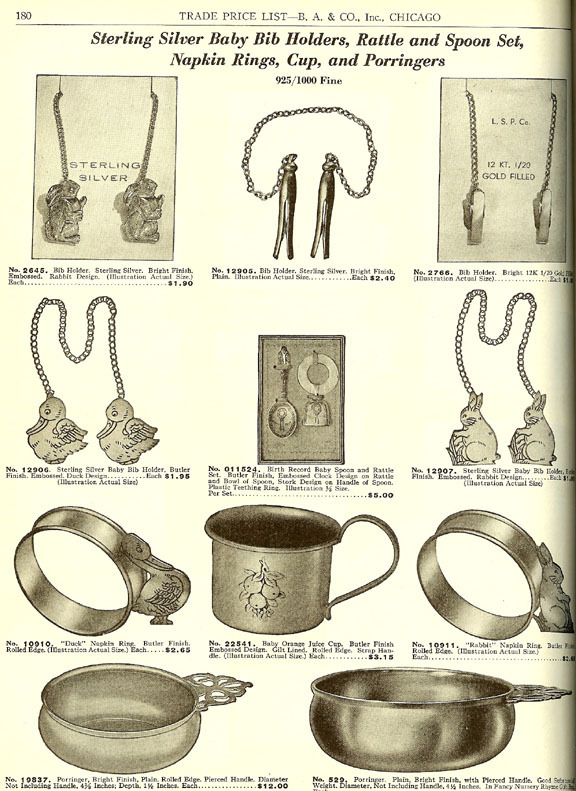 Webster 1894-present, in Attleboro, Massachusetts, known in part for their sterling baby items. 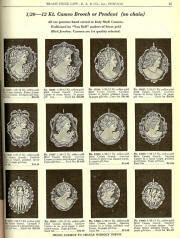 These can be seen in the Benj. 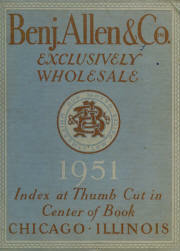 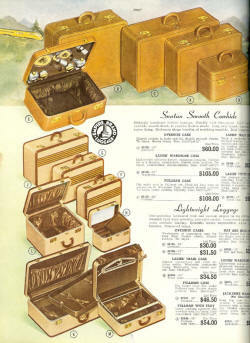 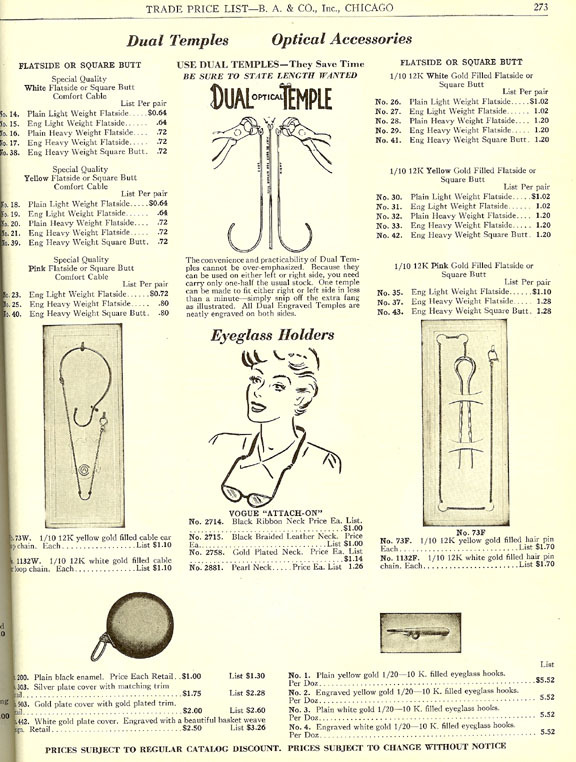 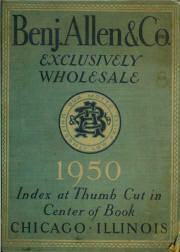 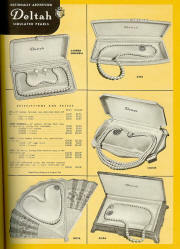 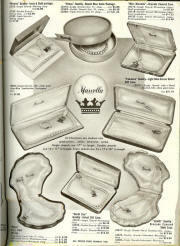 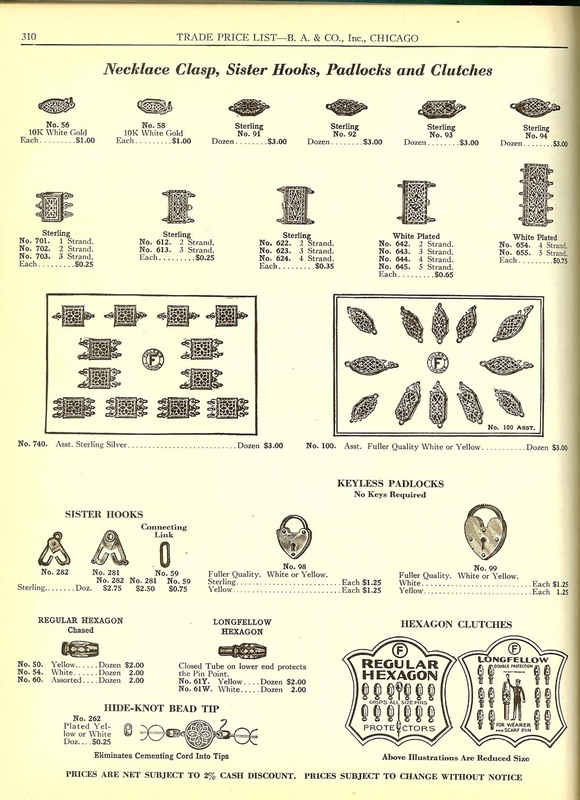 Allen & Co. Catalogue, Exclusively Wholesale, 1951 Edition. 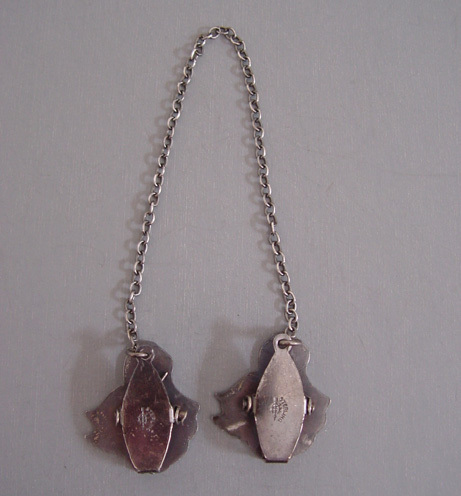 View View View View #N34795 Sterling silver baby bib holders, rattle and spoon set, napkins rings, cup and porringers, 925/1000 fine. 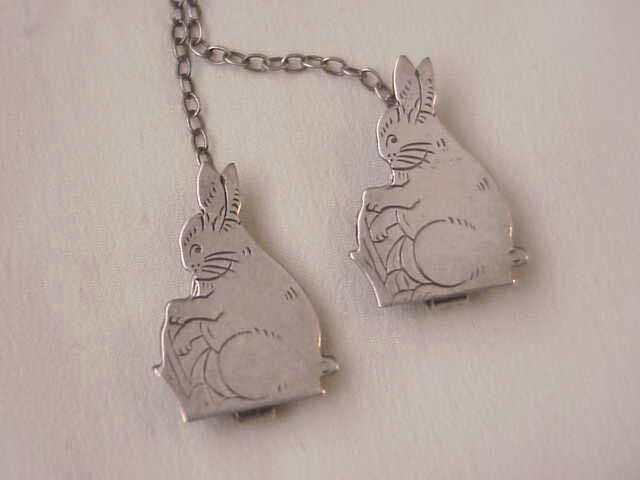 BUNNIES BIB CLIP in sterling for the well-dressed 1950's era baby. 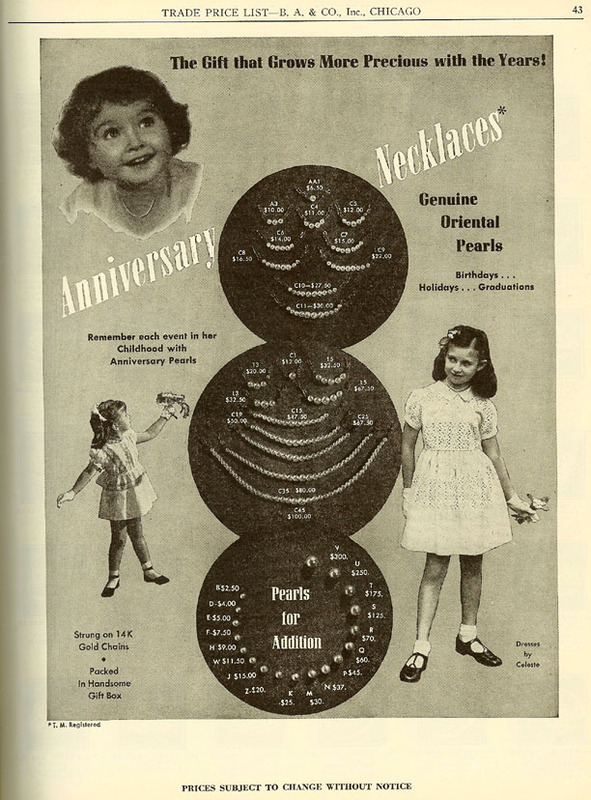 It was put around the baby's neck and clipped to a fancy hanky used as a bib. 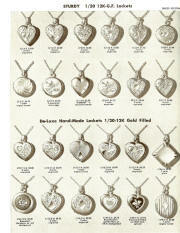 Solid Gold Diamond Set Pendants and Brooches. 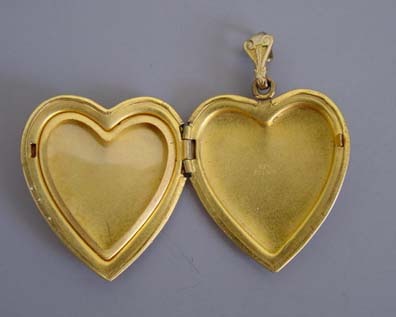 STURDY 1/20 12K-GF (gold filled) Lockets. 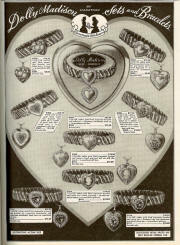 1/20-12Kt. 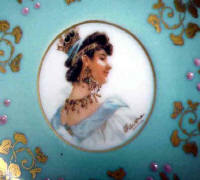 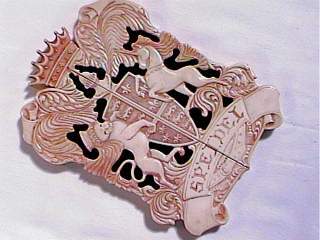 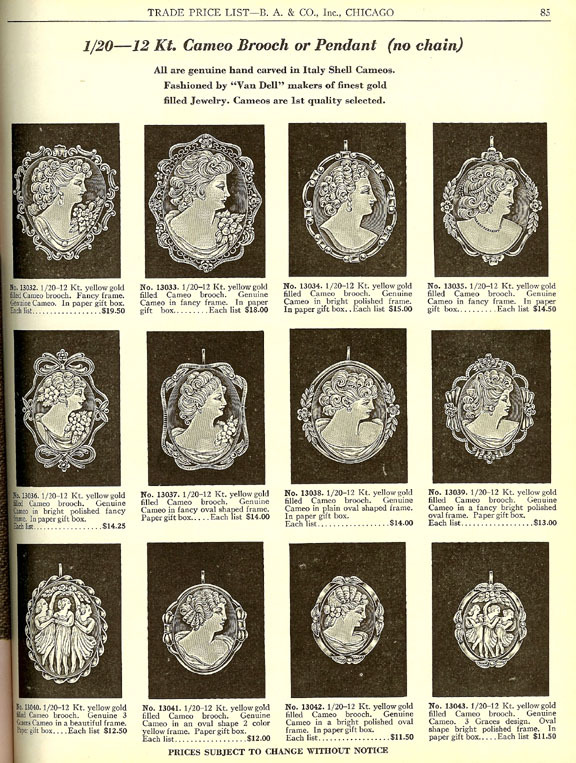 Cameo brooch or pendant (no chain). 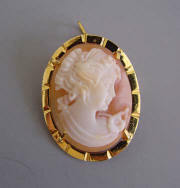 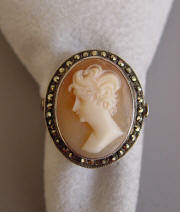 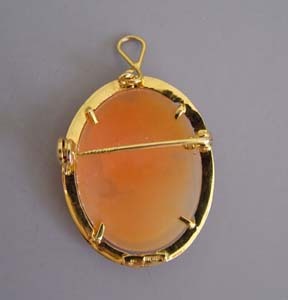 CAMEO brooch with pendant loop in gold filled setting, 1-1/4". 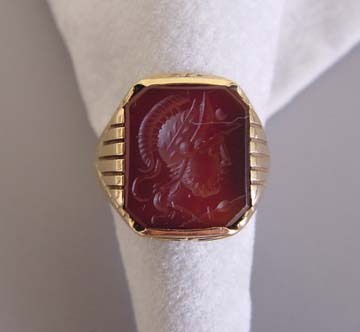 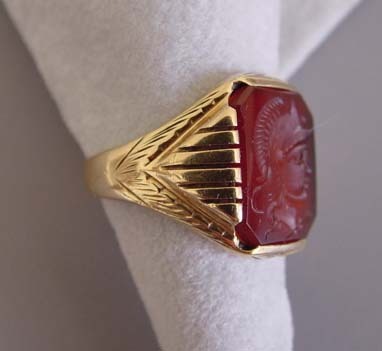 View #Q27936 Carnelian Cameo, Cameo, Fire Opal, Opal, Sardonyx, White Spinel, Imitation Emerald, Cultured Pearl and gold rings. 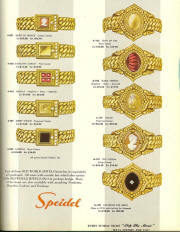 Sensational new all stone expansion bracelets! 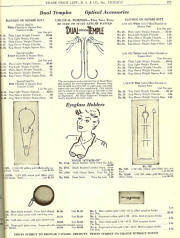 Briggs, Bates & Bacon Co., Attleboro, Mass. 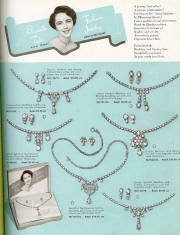 Necklace & Earrings Sets Carl-Art, Inc. 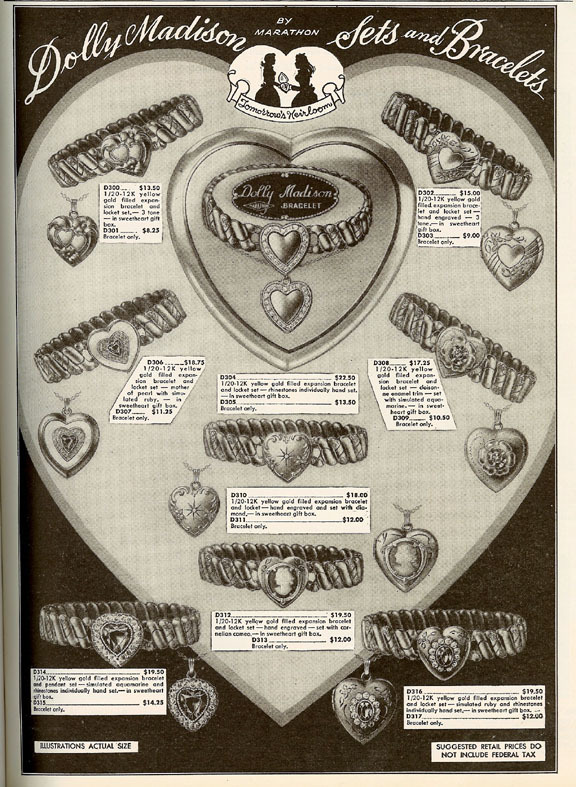 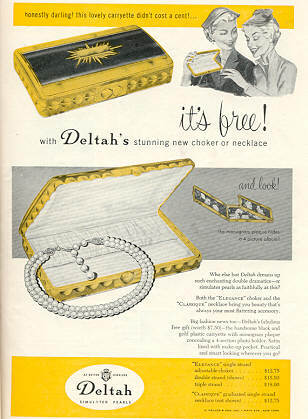 Ad for DELTAH Jewelry from unidentified 1954 magazine. 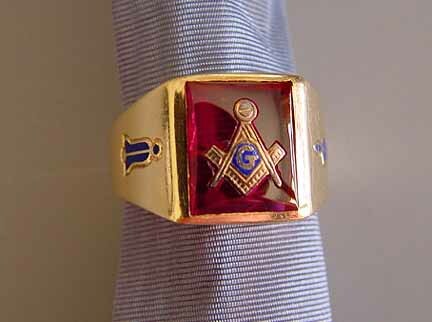 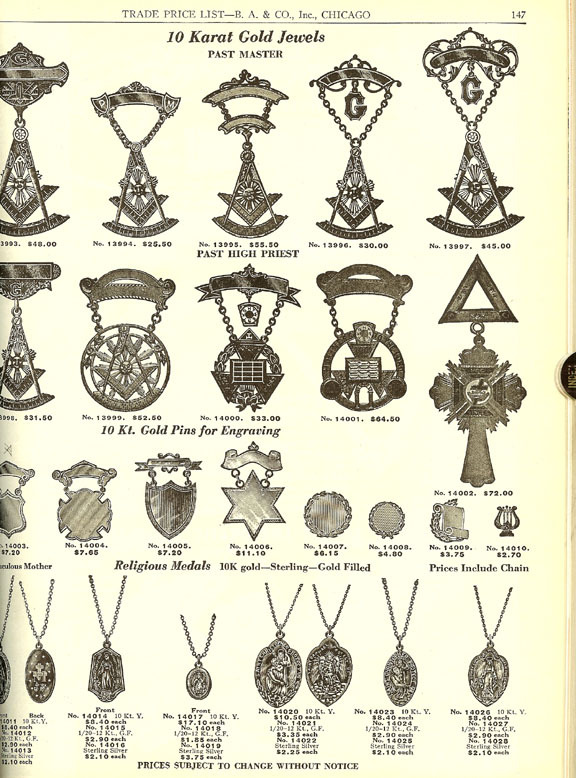 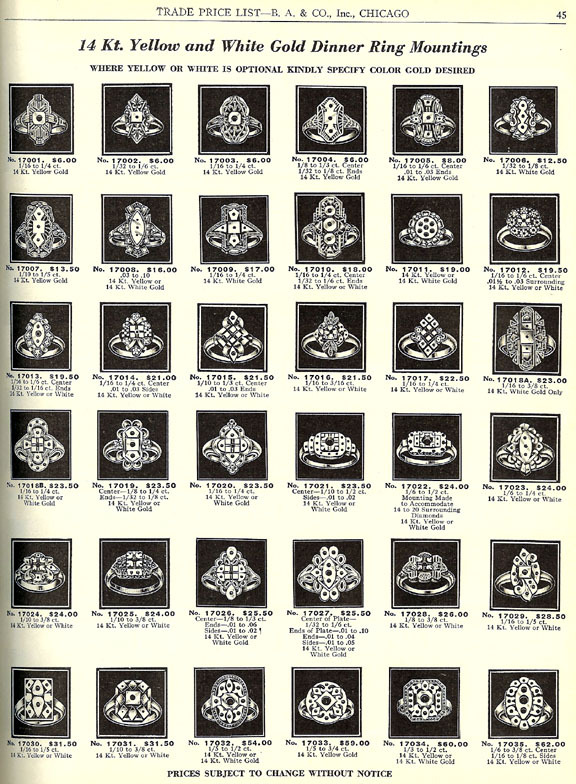 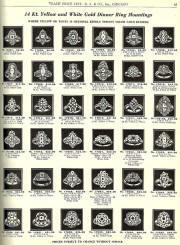 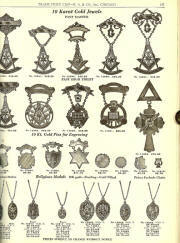 Masonic 10 karat gold jewels. 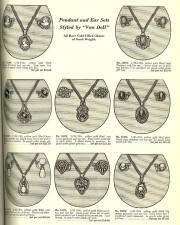 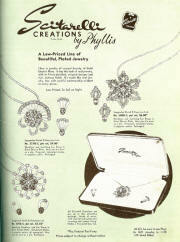 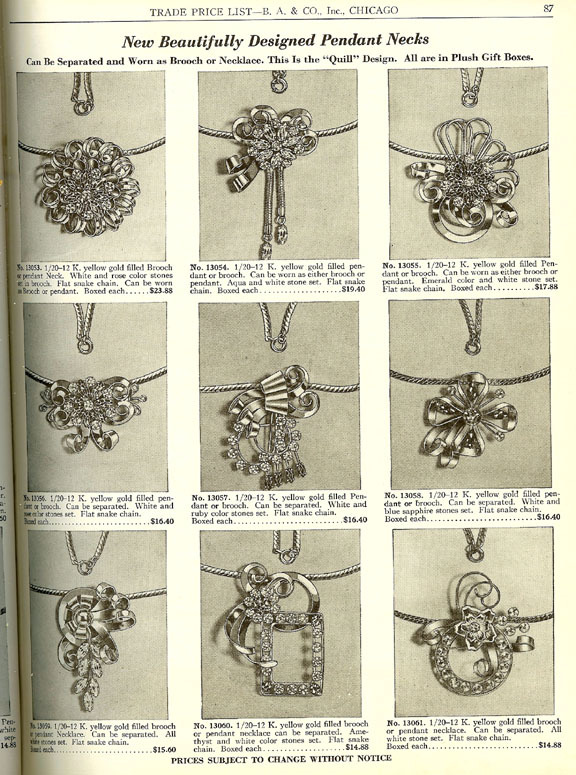 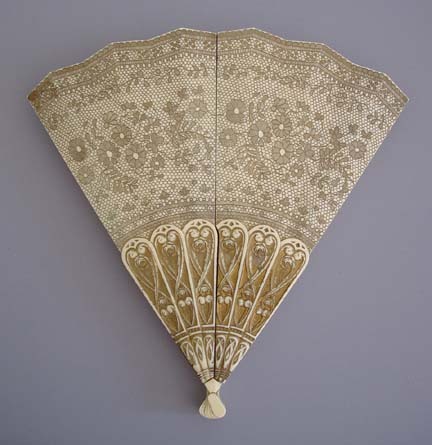 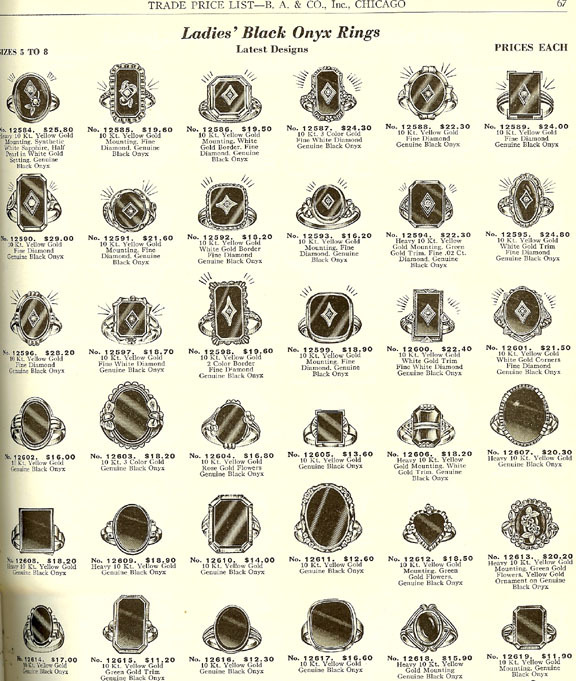 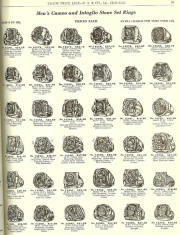 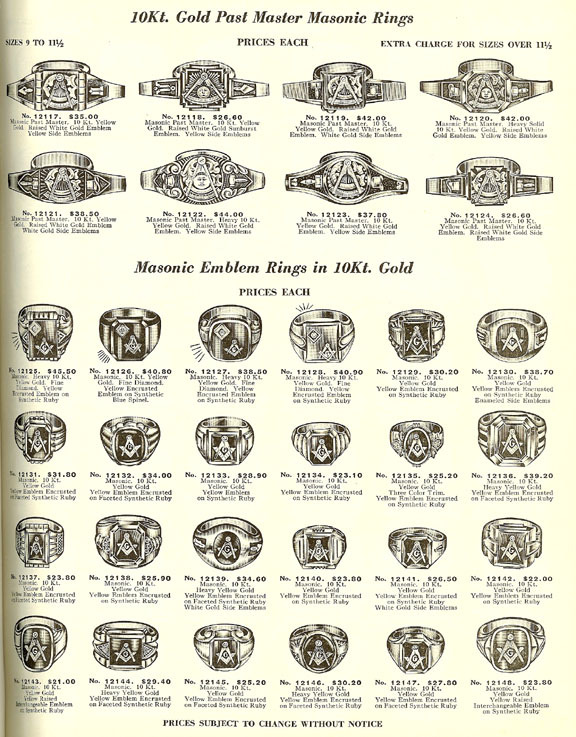 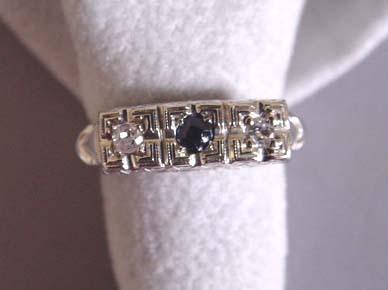 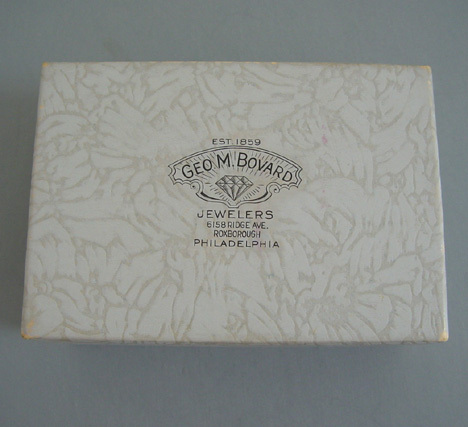 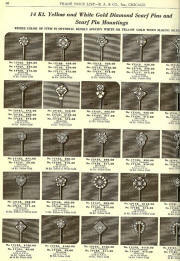 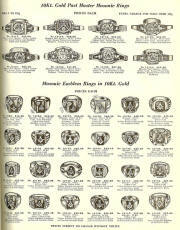 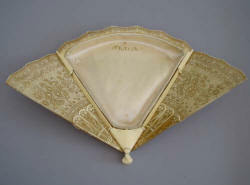 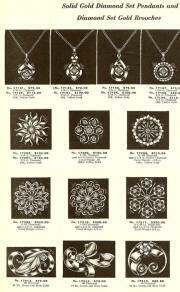 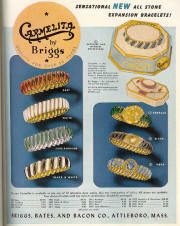 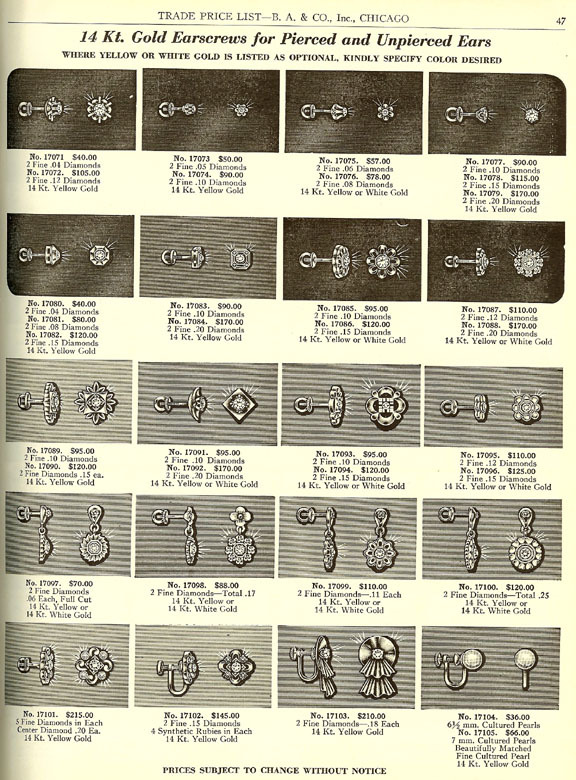 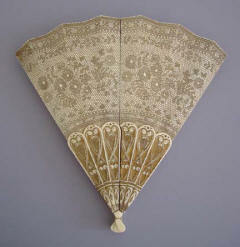 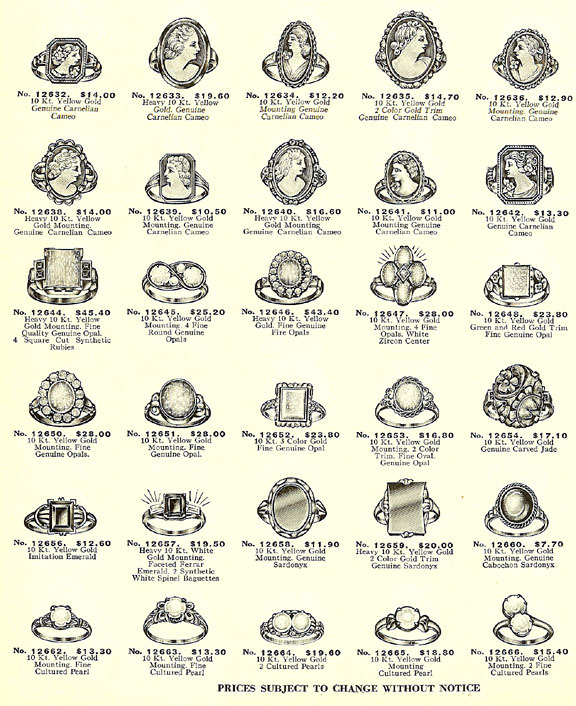 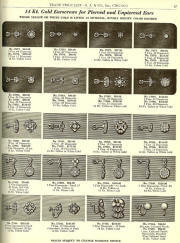 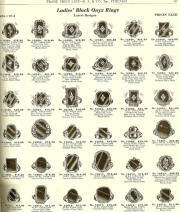 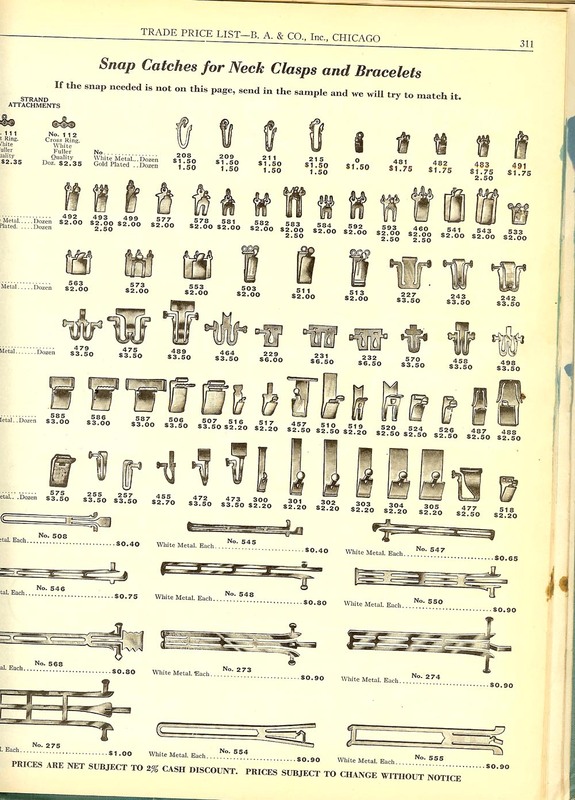 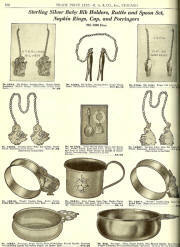 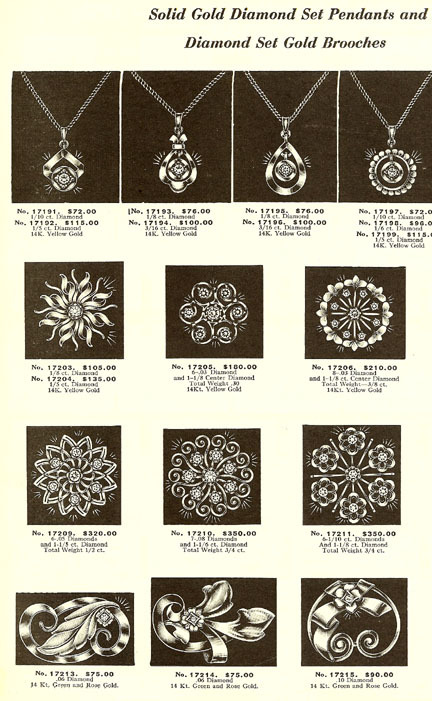 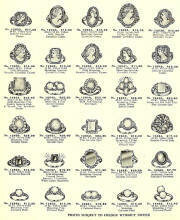 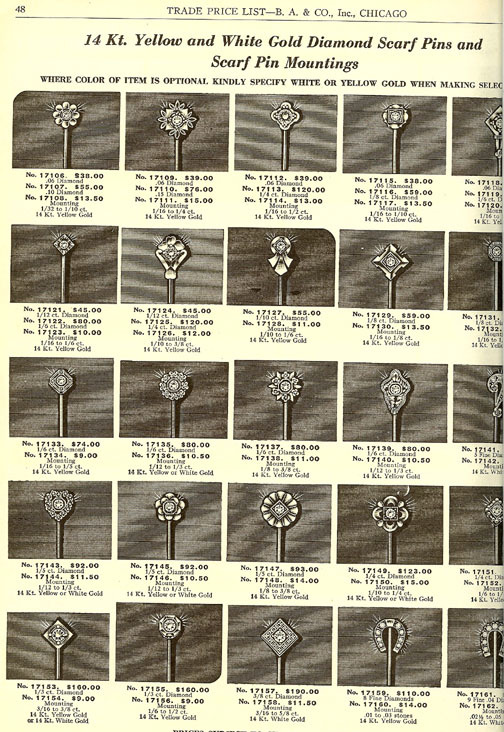 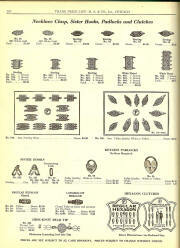 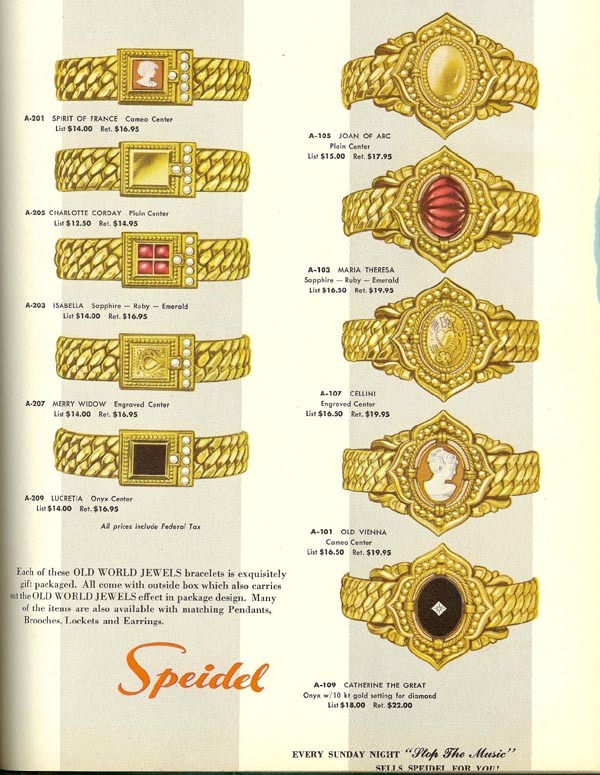 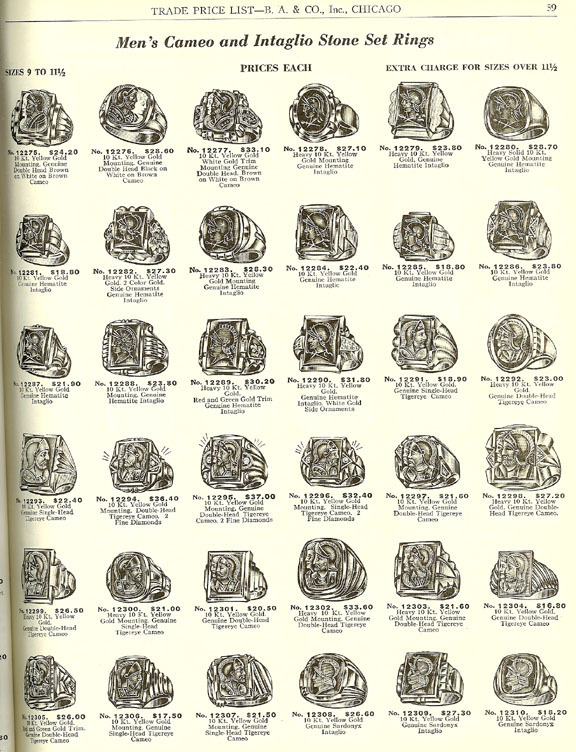 Some of these same styles can be seen as far back as the late 1800s catalogues with little change. 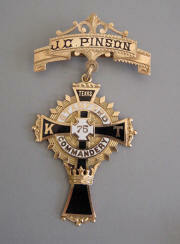 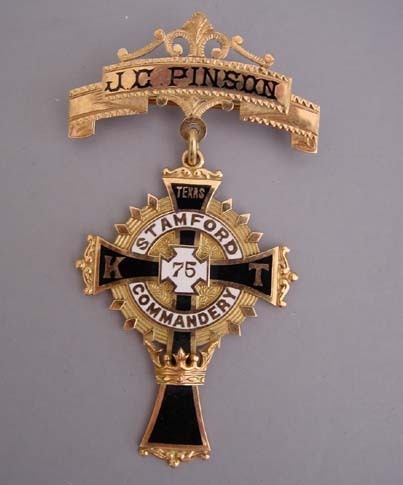 14 KARAT yellow gold with black and white enamel pin engraved "JC PINSON, Texas, KT, Stamford Commandery" , 2-1/4 by 1-1/4". 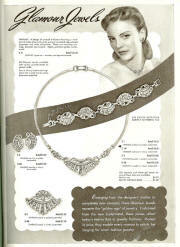 This is older than the 50s, but you can see the similarity in style that continued through the decades. 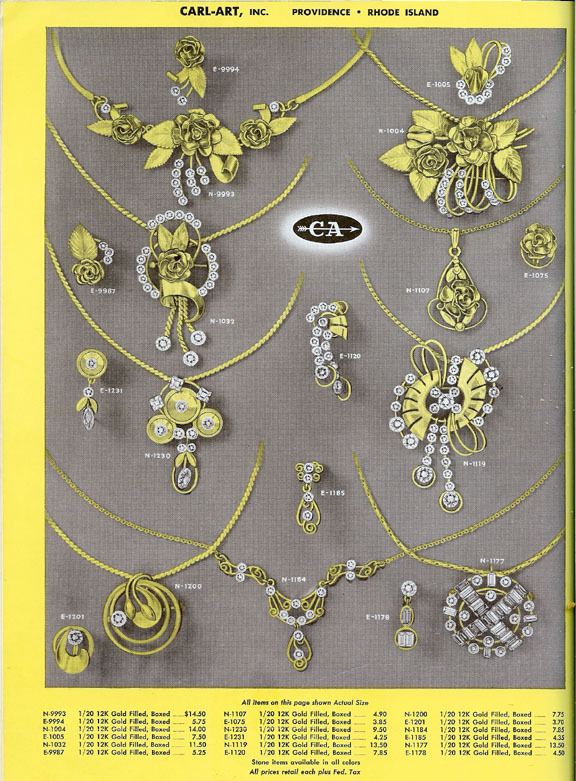 View #K26827 14Kt Yellow and White Gold Diamond Scarf Pins and Scarf Pin Mountings. 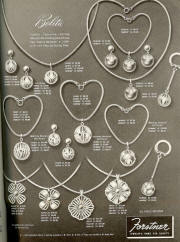 Beautifully designed pendant necklaces in "The Quill" design. 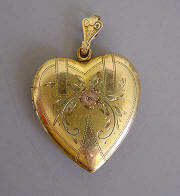 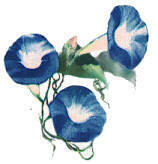 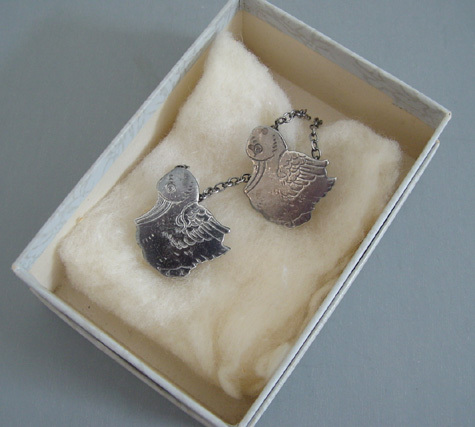 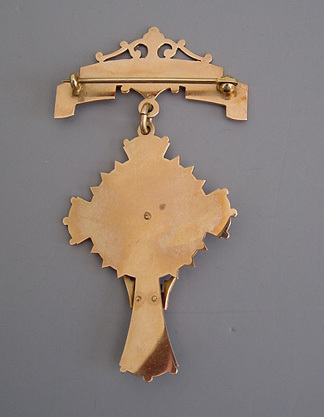 Can be separated and worn as a brooch or necklace. 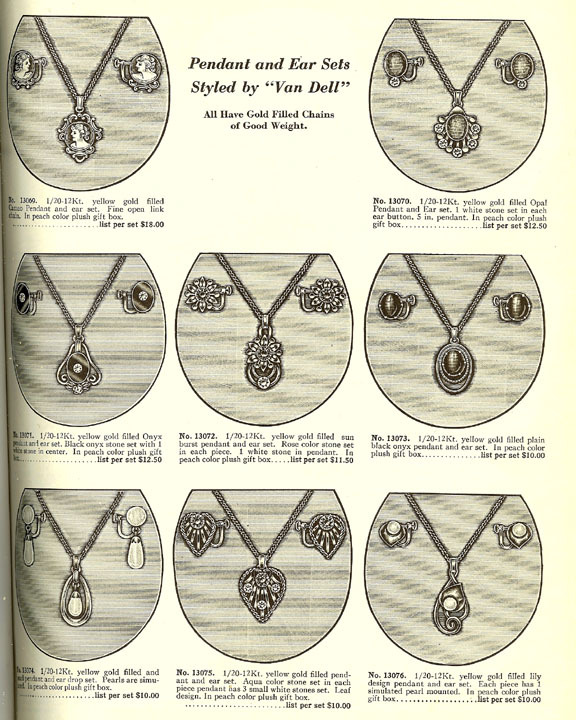 Pendant and ear sets styled by Van Dell. 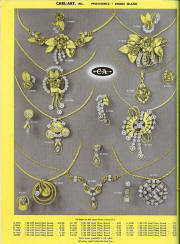 Glamour Jewels "Fantasy" Eyeglass holders, hairpin eye glass holders. One of the most expensive items in the catalogue was luggage, which strikes me as appropriate since we passed a set like this down three generations of our own family, all using it for years, and it is still in good condition. 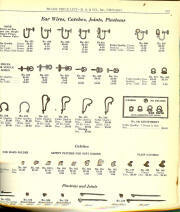 14KT Gold Earscrews for Pierced and Unpierced Ears.